In light of the recent massacre at Virginia Tech College - International television producer - Danish Broadcasting Corporation (Denmark) & Colorado Video Production (DP Rich Raney) along with the assistance of The Columbine High School, shoot and produce a ten minute segment on the anniversary of the Columbine High School Shootings aired for Denmark Television, April 24th, 2007, on the magazine show "Horisont." Production Team: Producer, Henrik Lerche, and Colorado Video Production DP, Rich Raney, along with AC Jimmy Fay, scout locations, conduct interviews and shoot extensive b-roll during a three day on-location production covering the yearly anniversary of the April 20, 1999 Columbine High School shooting rampage that left 15 dead (including the two perpetrators), and 24 wounded. Henrik Lerche, Senior correspondent for the (DR) Danish Broadcasting Network was onboard for the three-day production schedule. "We had a lot of ground to cover," said DP Rich Raney, "The three day shoot was organized completely from the ground up." Raney went on to say. "The Producer (Henrik Lerche) wasn't able to do any of the pre-production needed for the three days… every aspect of the shoot was done after his arrival from Denmark." Raney and Lerche shot 3 hours of Interview and B-Roll footage on the Sony D600 4:3 BSP camera, "I cropped the footage in the viewfinder to allow for a Letter Box crop to be added in NL Post Production back in Denmark" said DP Raney, "Much of the European Network PAL standard is 16:9," Raney said. AC Jimmie Fay added, "This was an aggressive schedule with multiple locations, interviews and setups." He went on to say. "Everything went like clockwork… a very successful shoot given the 'on the fly' pre-production - we were scheduling interviews and scouting locations the morning of each day of the shoot!" DR Senior Producer Henrik Lerche offered these comments about the program outcome: "The 'Horisont' programme Monday had ratings of 11% (575.000 viewers out of a total population of 5,5 mill Danes) and a 32,1% share of the viewing (of all the people actually watching TV at that time). It also received a 'grade' of 4.0 from the viewers (quality of the programme, rated on a scale from 1 to 5 with 5 as the best), which is very, very high! All in all a very successful show in anybody's book." Aerial Shot of Columbine High School in 1999Columbine High School was the site of the massacre on April 20, 1999, when Eric Harris and Dylan Klebold killed 12 students and one teacher, and wounded 24 others. The massacre made headlines around the world, making Columbine a household name, and causing a moral panic in American high schools. 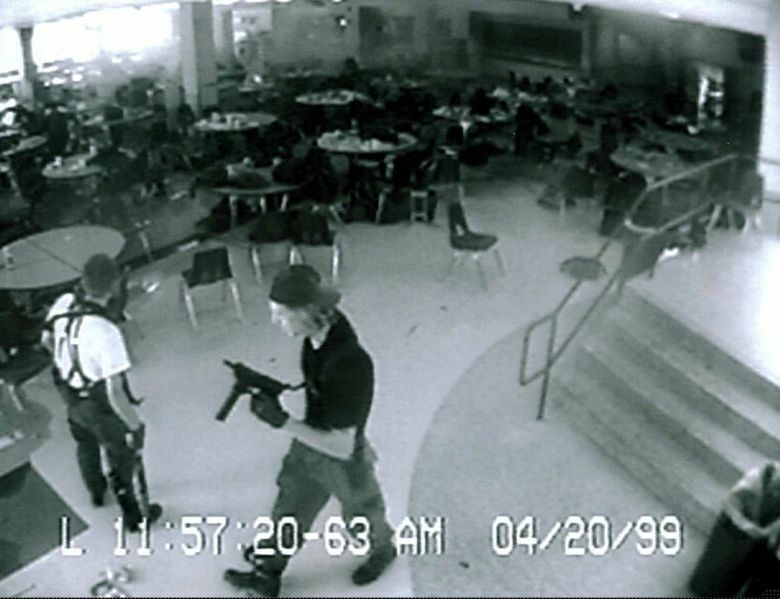 From left to right: Eric Harris and Dylan Klebold Columbine HS massacreThis image of Klebold and Harris was taken from the Columbine security cameras.